Did you know making soufflés isn’t difficult? They seem really intimidating, and I think it’s because when a door slams on a cartoon where someone’s baking, there’s a soufflé in the oven that sinks in the middle. We’re basically trained from a young age to fear these things! If you feel alright working with egg whites, then these are a cinch and they only took about 35-40 minutes from start to finish. And this particular soufflé is paleo! Well, the ingredients are, at least. I’m not sure if the concept of a soufflé is paleo. I can’t see Grog’s wife pureeing strawberries or beating egg whites, but you catch my drift. The original recipe for these came out of a cookbook called Austrian Desserts that I was excited to review. If you didn’t know already, I spent 18 months as a representative for the LDS Church in Austria, so Austria and all things Austrian are dear to my heart. If you want to read more about this cookbook, read my review over at Reading for Sanity! OK, so… this recipe wasn’t super descriptive. The fact that I’d never made a soufflé before didn’t help any. 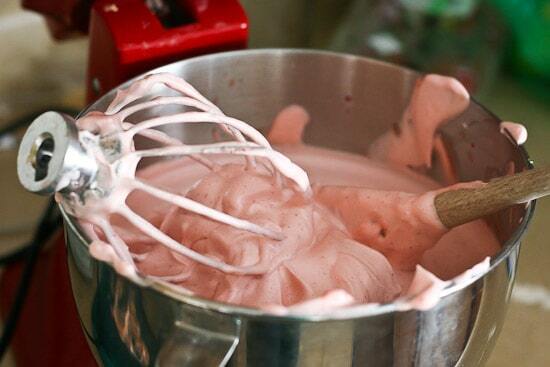 I had no idea when I threw strawberry puree and egg whites into a mixer for 10 minutes it would almost fill the bowl. For reals. And because it wasn’t fluffy enough, more egg whites are folded in. This next part cracked me up. “Six servings” it said. It didn’t tell me what size ramekins to grab, so I grabbed a few and started filling them. Then I went back for more. Then I went back for the rest. I FILLED ALL 11 OF THEM. This could have been a disaster trying to make sure they were all cooked evenly. And by the way, how do you tell a soufflé is cooked through? By its height? The recipe didn’t tell me that, either. It wasn’t a disaster at all, though. I even opened the oven door a few times to check them (my oven light’s been out for almost a year now) and THEY DIDN’T FALL. I think I understand why this is “six servings.” These are like strawberry-flavored clouds. They are SO light and foamy. I could eat the whole batch without batting an eye. OK, that’s not saying much since I could also eat half a cheesecake in one sitting. I can hold my desserts pretty well. I believe you could use roughly 10-11 6-ounce ramekins for these. I love these 6-ounce ramekins on Amazon and I use them a lot. You could also put them in about 5-6 10-ounce ramekins. My 6-year-old loves these and says she's eating strawberry clouds! 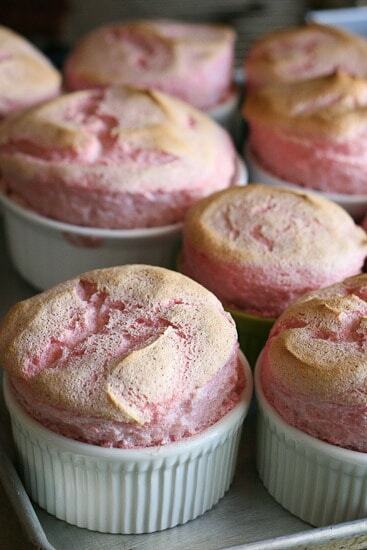 If you've never tried Strawberry Pudding Souffles, you'll love this paleo treat! Preheat the oven to 350 degrees F and gather some ramekins (large ones) and place them on a cookie sheet. 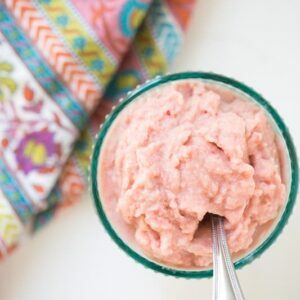 Puree the strawberries in a food processor or blender. Strain out the seeds. Put strawberries in the bowl of a stand mixer with the lemon juice, 2 egg whites, and 3 Tablespoons of honey. Beat on medium-high speed for 10-15 minutes or until the mixture is very light and frothy and almost fills the bowl. Meanwhile, beat the other three egg whites in a separate bowl until it begins to get frothy. While beating, slowly add in the remaining 3 Tablespoons of honey and beat until the whites form stiff peaks. 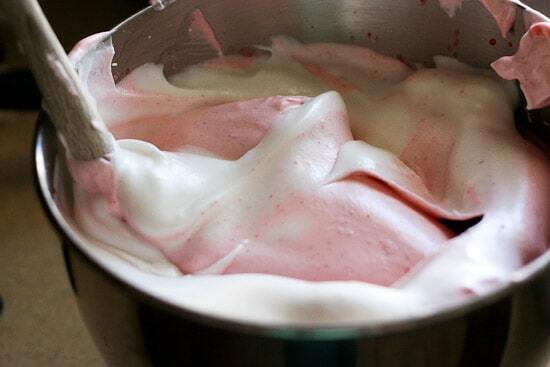 Gently fold the egg whites into the strawberry mixture. 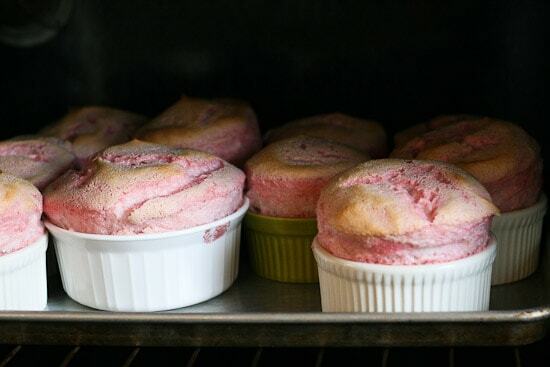 Divide souffle fluff into ramekins -- fill them full. (Do not grease the ramekins.) I have no idea how many you will use. I used about 9, but they were all different sizes. The original recipe says "6 servings", and I believe it would fill 6 10-ounce ramekin cups. Maybe 7. Bake for 10-12 minutes or until the souffles rise high above the ramekins and the tops are golden brown like a toasted marshmallow. Cool slightly and serve immmediately. You can also let them cool on the counter (they will fall... it's normal), cover with plastic wrap and store them in the fridge for a couple of days. They won't puff back up when you heat them up, and to be quite honest, we liked them better cold! Disclosure: This post contains Amazon affiliate links. Purchases made by using these links don’t cost you any extra and helps to keep my content free. Yay! They worked out. :) And that 6 servings thing is crazy. What kind of ramekins are they using that they get 6 servings? Oh my goodness, Natalie! These look insanely good. I think I just found my anniversary dessert for this weekend!!! I love how you call it the souffle fluff. And you’re totally right. Somehow we all internalize that “souffles are difficult” message. My stepmom used to make an absolutely spectacular cheese souffle that was one of my favourite things and it’s so ridiculously easy to make! I’ve never had cheese souffle!! Now I know how easy it is, it’s next on my list. What kind of cheese does she use? I so want to make these. I have yet to make a souffle because I am afraid of them flopping! I brought the Austrian Desserts cookbook to my parents house last week and my 95 year old Austrian great aunt was there visiting as well and she was looking at the book telling me all about the desserts she had as a girl growing up in Vienna and which were her favorites. I am going to tackle the Dobos torte since that was her favorite! It was fun listening to her stories and translating some of the recipes since she said some weren’t translated well. She is, um, very nit picky to put it lightly! ha ha! How sweet!! I can’t wait to see how your torte turns out. Don’t fear the souffle. It’s not hard at all. They do fall after they’ve cooled off and don’t look quite as pretty, but they still taste good. Mmm what an awesome dessert! Umm.. so cute!!! I love the natural pink color to these and I bet they taste amazing! omg!! so yum they look… can the eggs be substitute for sour cream or anything else? allergic to eggs. Sorry, I don’t think there’s a substitute for eggs in souffle. Whipped egg whites give souffle their texture, so you can probably understand why sour cream wouldn’t work. Bummer! I almost just took a souffle dish from my momma’s house that she got as a wedding gift and has never used. I told her I would get it next time I’m home (I took a whole box of other dishes this time…ya know…for the blog ;-) ). I think I might have to give this a try when I do get it. Also: I can’t see Grog’s wife pureeing strawberries or beating egg whites, but you catch my drift. <—Actually laughed out loud. I was wondering why the need to strain the seeds? Just curious. It’ll give it a better texture, and you won’t get seeds stuck in your teeth. You can probably leave them in, though! Makes sense! Thanks much – I look forward to making these. Just took these darlings out of the oven and the recipe worked out just right. Do I have to use raw honey or will regular honey work as well? I would love to try this but I’m not a big strawberry fan, could I use raspberries or do chocolate? Also, why the lemon? I’m generally not a citrus person, is it for flavor or for another reason? I haven’t tried using raspberry, but I imagine it might work! Lemon brightens flavors — especially when you use a little with berries. It doesn’t make it taste like lemon at all, it just makes the berries taste more vibrant. I made these today and they were delicious. Very light and fluffy. I didn’t have a stand mixer so just stood there for 15 mins and held the mixer, but it all worked out well. This recipe does produce a very large batch of souffle’s. I filled up (3) 15 oz. ramekins + (4) 9 oz. ramekins + (4) 1/2 cup ramekins. Straining the seeds was a little time consuming, but well worth the effort. Since they are light and fluffy it would ruin the texture of each bite if you encountered small seeds (personal opinion). Thanks for the recipe! Glad you had luck with it! I found myself scrounging around for ramekins, too. It made it hard to judge just how much it made. Haha. is the inside texture like a pudding, or more dry? Also, do I have to strain the seeds? 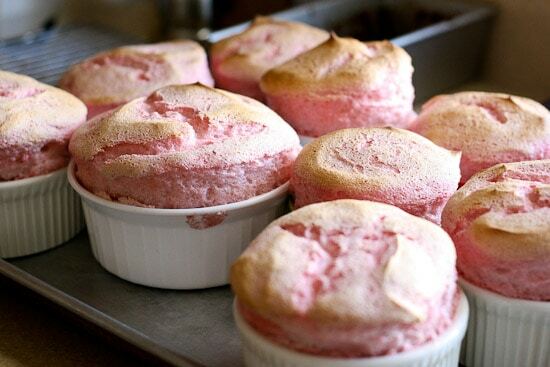 And does the souffle just taste like strawberry??? How far do you fill the ramekins? Half way full or more than that? I am gluten free and this would be a great treat.. This looks delicious.. Just wondering if you have to grease the ramekins first or just fill up ? Thanks! Nope, don’t grease them. 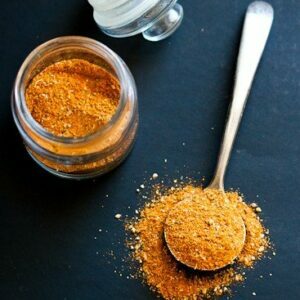 If you grease them, the mixture doesn’t have anything to cling to and it won’t puff up as much. Can you make these half way cooked ahead of time and finish cooking while having main course? Can you bake in larger glass baking bowl? I do not have ramekins. Very intrigued by this recipe! Can I use 1 cup glass prep bowls instead of ramekins? Sure! As long as they’re oven safe, you’re good to go. Could you use some type of foil, disposable looking ramikin for a huge group, say 250? So I made these and after 10 minutes in the oven they collapsed. when I spooned it out it shriveled up into the smallest amount like it was non existent. Do you know what the reason for this would be? They collapsed in the oven? Did the oven get opened while it was baking? They can be temperamental to sudden temp changes. After they come out, they do sink somewhat, but there should still be a souffle left to eat. Did you overbeat your whites, possibly? I’m curious why the recipe ingredients lists the honey as “divided”? It looks like all 6 tbsp are added to the 3 egg whites. Did I misread something? 3 tablespoons are added to the egg white/strawberry mixture. The other 2 tablespoons are added to the egg whites alone. I am confused as well. Says 6 tbsp of honey divided. But she says 3 tbsp with the egg white and strawberry mix and 2 with the egg whites . that is only 5 tbsp. Where does the 6th tbsp go? This look so good! 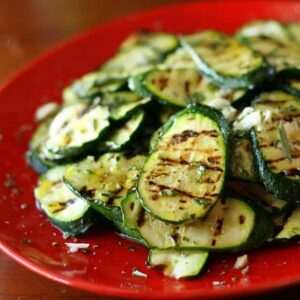 What a yummy and healthy one to serve guests! They keep for a few days in the fridge, but they won’t be puffy again. 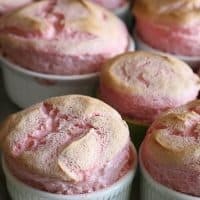 I had a similar Strawberry Pudding Soufflés at a restaurant recently and found myself craving it and wondering if I could recreate it today. Thanks, Natalie!